Before you line up anything else, you want to make sure that the domain is available for your blog name. If it’s not, and you’re set on a particular name, you may need to choose a variation of the name or a .net., .org or another extension. I recommend staying with a .com if possible, so I always advise choosing a name and checking if the domain is available first. When you have a name in mind, visit Instant Domain Search to see if it’s available. If it’s available, you can choose to purchase it through a company like GoDaddy or Network Solutions to purchase the domain. When you have a self-hosted WordPress blog, it means that you need to find (and pay for) a host for your website. This is similar to what all other business websites have to do. Rather than being hosted by Google (on Blogger) or WordPress (on WordPress.com), you are going to be the master of your own domain on your host (using the WordPress framework). There are a number of different hosting companies including BlueHost, WP Engine, GoDaddy, SiteGround and more. The two companies that I recommend to my clients (and have used myself) are WP Engine and SiteGround. SiteGround is a more affordable option if you’re just starting out and have limited funds (as low as $3.95/month!). They offer great customer support through LiveChat and will also help you migrate your site from WordPress.com (more on this later!). I recently switched from WP Engine (I loved them, but they were too pricey) to SiteGround, and I wish I had done it sooner. They made the whole transfer process SUPER easy and painless and I got a free SSL certificate. An SSL certificate is great for Google ranking and if you want to sell anything on your blog you should definitely have one! When you have a self-hosted WordPress blog, your web host is different than WordPress. WordPress is the free software that you use to operate your blog and the host company is who puts it on the internet. Once you have purchased hosting, you will need to visit the cPanel on your web host site and look for the WordPress icon. Double click on it, and it will guide you through the WordPress installation. You will be prompted to set up a username and password to access your WordPress dashboard (the hub of your website). A premium WordPress theme is a must if you’re planning to build a profitable blog– trust me on this one! A premium theme will help you stand out from the crowd. It will also allow your site to perform well and look beautiful on mobile devices (where SO MUCH of your traffic is likely to come from!). These types of themes also allow you to easily customize headers, colors, fonts, newsletter sign-ups, widgets and more. Most premium WordPress themes run on the Genesis framework, so you will need to purchase and install that before you install your premium theme. You only need to purchase the Genesis framework once, and then you can use it for almost any other premium theme you choose. I have used themes from Pretty Darn Cute Design and Bluchic (I’m currently using the Isabelle theme). I would wholeheartedly recommend both of them. I also love the clean, modern designs from Restored 316. Each of the three companies provides a lot of customer support in the form of tutorials and videos, and I found them easy to use. You can also look at themes available on Themeforest, which has a HUGE supply that you can filter by category, price, etc. Your theme should come with instructions on how to upload and activate it. You can easily do this through your WordPress dashboard. Once you have your theme loaded and ready to go, you will want to customize it with your own header image/logo, fonts, and colors. Check your theme’s tutorial to see how large the header image is so you can format your image correctly. You can use a tool like Canva or PicMonkey to create your own header image or you can just use the default header that comes with your theme. I use both services regularly. When you are satisfied with your blog’s header, take a look at the fonts and colors to decide if you would like to change them. The plug-in Easy Google Fonts will help you easily change fonts. If you need help choosing colors for your theme, check out the Adobe Color Wheel to find color combinations that work well together! It will provide you with the appropriate hex codes to use for colors. Now that your self-hosted WordPress blog is ready to go, think about what pages you would like to have on the blog. For example, this blog has a Homepage in addition to Food/Drink, Family Travel, Training, etc. Set up your pages and then click on the Appearance tab in your WordPress dashboard and select menu to customize your navigation menu, which is at the top of your site. Write Your First Blog Post! Next, you will want to set up an e-mail for your new self-hosted WordPress blog, set up social media platforms and start promoting! You may also want to check out my list of Blogging Tools to find helpful services I use on my own blog and recommend to my clients and my 7 Tips for Beginner Bloggers (Who Want to Make Money From Their Blog!). Previous Post: « Headed to Burke Mountain in Vermont! Hi, I with Wix now, is it possible to transfer your page to the WordPress? Yes, you can definitely transfer from Wix! SiteGround is great at helping with migration ! 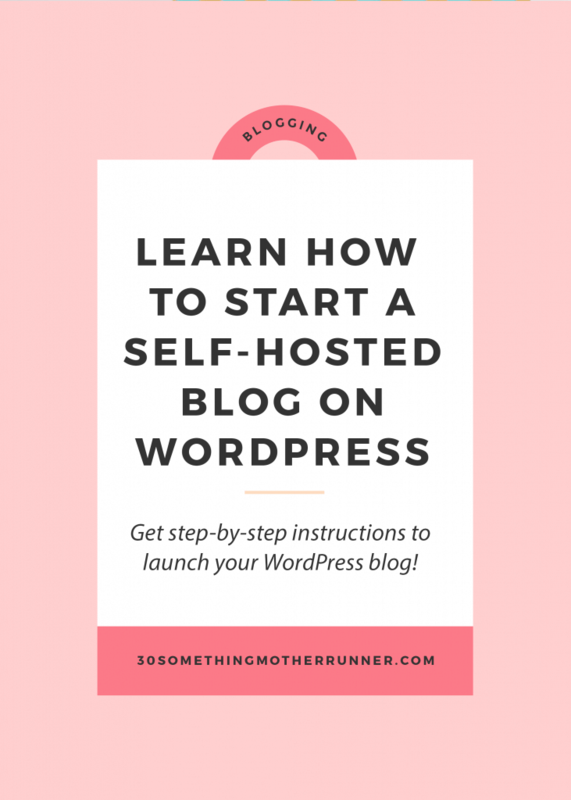 I have been on WordPress for awhile on the premium plan and decided to go to a self hosting option on Siteground. I had absolutely no idea what the point was and how to ever do anything. I read so many articles on step by step directions but i still didn’t understand how to transfer all my stuff over and what the point was. I ended up cancelling my plan and requesting a refund! ): I’m going back to WordPress.com for awhile just because it makes me feel like i understand better. Hoping to try self hosting again some other time.